For a long time, downtown Dallas was the business district and nothing else. Streets cleared out shortly after five. Historic buildings sat empty at night, some empty during the day. 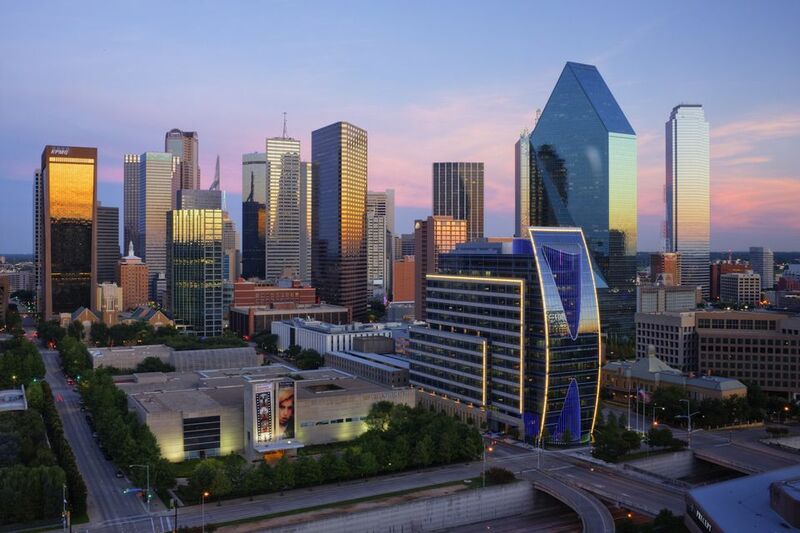 In the last decade, the city of Dallas and several developers have made a concerted effort to bring life back to downtown. Nowadays, downtown still has the businesses, but the efforts have brought in urban dwellers, more shopping, nightlife—downtown Dallas has a character all its own. Downtown is roughly defined by the freeways around it: Central Expressway (75, I-45) on the east, RL Thornton Freeway (I-30) on the south, Stemmons Freeway (I-35E) on the west, and Woodall Rodgers Freeway (366) on the north. Condos in the downtown area come with deluxe amenities, such as onsite fitness centers, pool, hot tub, and a chef (yes, chef!). One-bedroom condos start at $130,000 and two-bedroom condos start at $215,000. Renting those same condos: one-bedroom, $990+; two-bedroom, $1450+. Several public schools in the Dallas Independent School District serve the downtown area. Some of Dallas's best restaurants are downtown, including the French Room and Stephan Pyles. Over two hundred cheap to moderately priced restaurants are tucked into and underneath the skyscrapers downtown. Nightspots pop up downtown all the time. Like the restaurants, they are between and beneath the buildings. West End Historic District has a concentration of well-known clubs and restaurants. Deep Ellum, famous for its live music venues, is nearby. Dallas Farmers' Market offers a fresh selection of local and imported produce and meats, as well as flowers, handcrafts, live music, and cooking classes. Urban Market, in the ground floor of the Interurban Building, has a cafe, a cocktail bar, a florist, a Dallas Credit Union branch, oh yeah, and groceries. The flagship store of Neiman-Marcus is at the corner of Commerce and Young. Jos A Banks is down the street from them. Dozens of trendy boutiques line Commerce and Main. The Arts District is adjacent to downtown. The Dallas Museum of Art, Meyerson Symphony Hall, and Nasher Sculpture Center are all here. West End Historic District is also nearby. Enjoy a selection of dining and entertainment, along with frequent annual festivals. Near Union Station, Dealey Plaza and the Sixth Floor Museum provide tourists and locals the opportunity to learn about history and President John F. Kennedy. American Airlines Center is the home of the Dallas Mavericks and the Dallas Stars. Shows and concerts are often performed here. It's a good walk or a quick train ride away from downtown. Post offices are located at 1201 Main Street, 500 S. Ervay Street, and 700 N. Pearl Street. The J. Erik Jonsson Central Library is at the corner of Ervay and Young and showcases several important collections and ever-changing art exhibits and hosts author talks and readings. In an emergency, dial 911 to reach police, fire, or ambulance. Emergency call boxes are scattered about the downtown area in case you have no phone with you.